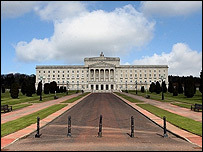 The leaders of the four main Northern Ireland parties have announced how the ministerial portfolios will be shared in the new power-sharing executive. When it meets on 8 May, Sinn Fein will assume the education ministry - for the second time - along with regional development and agriculture. The DUP are taking finance, economy, environment and culture. The Ulster Unionists take health and employment and learning, while the SDLP take social development. Secretary of State Peter Hain described the dealings at Stomont as further evidence of the very positive approach that the parties are taking to the restoration of devolved government. Ulster Unionist party leader Sir Reg Empey said taking on the health portfolio was a huge challenge. "It is - if you like - something that's vital and important to everybody in the community," he said. "There was a lot of criticism the last time that people had run away from the issue, and the way the selections were made it would be difficult to not come to that conclusion. "The Ulster Unionist Party is not going to tun away from a challenge and we realise this is going to be difficult." 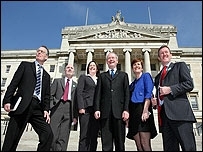 Earlier on Monday, Sinn Fein announced its ministerial team for the new assembly: Martin McGuinness, Conor Murphy, Michelle Gildernew, Caitriona Ruane and Gerry Kelly. Mr Murphy said that it would be some time before his party revealed which person would be in which ministry. "Today was simply a matter of getting the departmental choices. What we'll do now is match people to that," he said. Mr McGuinness had refused to commit his party to the education department in a news conference before the departments were picked, although he said they were very interested in the issue. "The whole issue of education is obviously a huge challenge for whoever takes the position there is a lot of unfinished business to be dealt with," he said. There are two main thorny issues facing a new minister - the future of selection for post primary schools and the prospect of naming hundreds of schools for closure because of a shortage of pupils. Sammy Wilson of the DUP said there are many battles ahead for Sinn Fein in education, but he said his party had ensured safeguards were in place to prevent "any rogue education minister" implementing policies that the DUP does not support. DUP leader Ian Paisley had the first pick of the departments under the d'Hondt formula, which uses assembly seats won by parties to calculate ministerial entitlement. Sinn Fein president Gerry Adams had second choice. December 1999 was the last time the party leaders agreed to select their departments. Secretary of State Peter Hain has promised to give ministers-in-waiting access to their departments. At the weekend he also agreed to a request from Mr Paisley and Mr McGuinness to hand over offices at Stormont Castle. Last week, in a ground-breaking meeting at Stormont, Ian Paisley and Gerry Adams agreed to share power in a restored NI Assembly on 8 May.